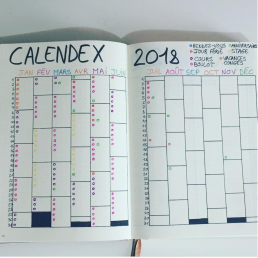 Inspiring Calendex Spreads from the community. The Calendex can look entirely different depending on what you need it to do. If you want your Calendex to be as effective as possible, you need to put your stamp on it. Set it up the way you need for the things you want to track. 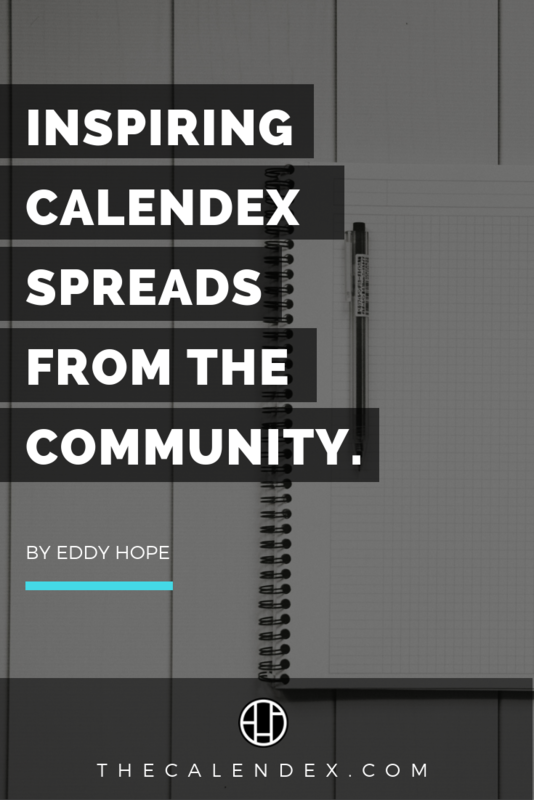 Remember that the Calendex brings together the visual aspect of a calendar and the function of an index. 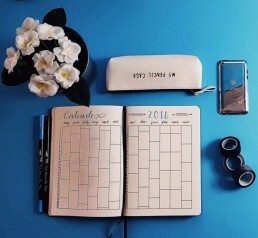 It serves as a reminder of when you busy in the near future, projects you need to finish, the tasks you need to do or major events you need to prepare for. This may be a little overwhelming or be confusing especially if you’re new to the Calendex and want to get started so I have gathered some beautiful and functional Calendex setups that will no doubt inspire you. They’ve certainly opened my eyes. Take some time to setup the Calendex to be it’s most useful for you, don’t be scared to experiment. Let’s dive in! If you’re looking for something then this is a good example of a very simple and clean layout before any data is added. As it is not filled in yet it allows the viewer to get an idea of how the structure of the Calendex is formed and how it looks in its simplest version. As well as being well drawn, the beautiful lettering really sets it off and has been complemented by a lovely composition and blue background to highlight the blue title. Follow @Erresbullet on Instagram for more. Wow. Literally, my first thought when I came across this. A unique spin on the classic layout mixed with some lovely lettering. It as been designed in such a way that the weeks/weekends all line up as you can see from the light grey highlights. Amazing layout definitely one of my favourites visually. Follow @grey.and.copper on Instagram for more. Well, how about this… no page numbers! Purely used in this instance with a key and some nice bright colours. 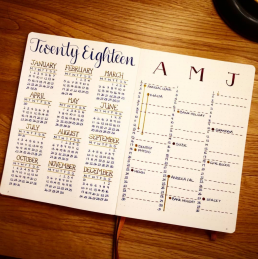 Not only is each month written in different colours but so are those fancy little circles. Very eye-catching. As you can see it is very easy to see what you have scheduled on each day. Follow @precious_bujo on Instagram for more. I like this Calendex spread as it spans a 6 month period. 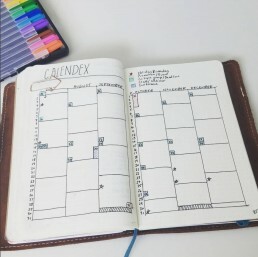 This is great if you need more space for each day but also good if you go through notebooks quickly. I also like the clean and minimal look and the fact it has a key in the top right corner. Minimal, simple and functional. Follow @aisaacswrites on Instagram for more. This modified Calendex was drawn up by Caitlin and is a good example of how it can be adapted to suit your needs. 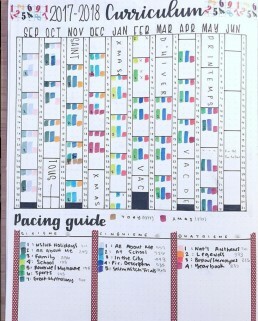 It was made to help plan the school year as a ‘curriculum pacing guide’. Follow @sunshineandstationery on Instagram for more. This is a nice one for those of you who will appreciate a minimalistic style with a hint of personality. I like how the tools used to draw it out have been included in the photo too. There is a nice colour used to highlight certain sections with a key for reference across the bottom and some days have been circled to identify special events. If you look closely you’ll also notice some writing along some of the ‘day rows’. This is a different approach making good use of space. Follow @kissmybullet_ on Instagram for more. I’m slightly in awe of the neatness on Leanne’s calendex. 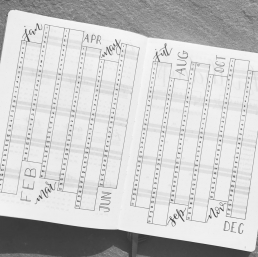 The dates themselves are used to structure the table layout with the weekends being blocked in by the only lines she evidently needs. 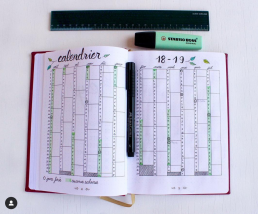 I like the 3-month layout, it gives you a ton of space to work with and the full year calendar on the left page is great for quick reference. We’re all very glad you ‘finally got your act together’ Leanne. It looks great. Follow @pagesbyleanne on Instagram for more. This is only a handful of creative and functional setups from the Calendex community. Hopefully seeing these will inspire you with some fresh ideas when setting yours up. Just remember that it is your Calendex and your notebook, so set it up in a way that works best for you. In the meantime keep creating and stay organised. And have my best content and freebies sent straight to the comfort of your inbox. Just add your email below to get your free quick start guide.